So powerful, it even helps your dishwasher stay sparkling. Delivers Cascade’s best clean with a premium, advanced triple action formula that helps prevent residue on your dishes, and even filming on your machine. Scrubs away tough 24 hour stuck-on food. Eliminates the need to pre-wash dishes. Has the Grease Fighting Power of Dawn. 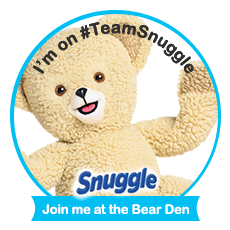 Show Us YOUR Sparkle & Win! So show us how sparkly Cascade® makes all YOUR pots, pans, plates, glassware and silverware! Enter† Cascade's #MyPlatinum Instagram Contest for a chance to win a KitchenAid® Kitchen Makeover and a 1-year supply of Cascade®! Weekly entries have a chance to win a KitchenAid® Dishwasher and six-month supply of Cascade® too! You must be a registered member of Instagram to enter. Be sure to tag your photos with #MyPlatinum to enter. If you're not a member, you can join Instagram right from your mobile phone. Cascade has also partnered with Top Chef Judge and editor of Food+Wine magazine, Gail Simmons, to discuss why meal presentation is just as important as preparation. See videos on Cascades YouTube Page. 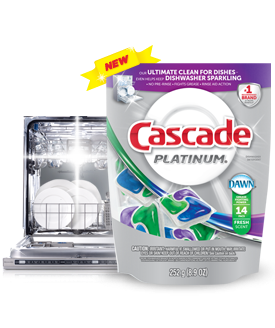 I LOVE these new Cascade platinum pacs~ My dishes are so clean and iI dont have to spend the extra time washing them before I put them in the dishwasher! I can load them all dirty and not worry about them still being dirty or having spots when they come out of the dishwasher!